We talk about family life, gardening, organic blog, health, thrifty Thursdays, provide product reviews you can trust and host Friday giveaways. 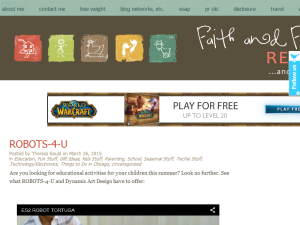 This what your Faith and Family Reviews Blog Ad will look like to visitors! Of course you will want to use keywords and ad targeting to get the most out of your ad campaign! So purchase an ad space today before there all gone! Fitbit, Apple Watch, Apple Health Kit, Google Fit, Under Armour Record, and Nokia / Withings. Hidrate Spark comes with a long lasting replaceable battery, so no charging required. The Hidrate Spark 2.0 holds 24 fl oz (710 ml) and comes in five eye-catching colors. the bottle is made with BPA-Free Titan plastic and without a straw. This helps prevent breaks and spills. It even comes with a handy clip carry hook! This water bottle is not only aesthetically pleasing but it is revolutionary! The bottle helps you drink more water! The bottle comes included with a sensor stick, powered by two coin cell batteries. (That means no charging to worry about!) When you drink out of the bottle, the sensor measures how much you drank and transfers this info to the hydration app, which tracks your progress throughout the day, week and month. The bottle even the bottle detects when you’ve taken off the cap, so you won’t get any false sips from emptying or refilling the bottle. What do we think about the water bottle? The colors the bottle comes in are very stylish and pleasing. We also found the water bottle very useful. The water bottle helps you get your needed intake of water. There are many people out there who wish to drink water more water. This bottle is especially important if you need to get fluid reminders for medical reasons. For adults and children this is a great reminder device! It absolutely DOES help a person reach their water intake goals! So how does it remind you? Once set up via bluetooth, which is very easy. The bottle blinks when water intake is needed. Once the drink has been taken the drink has been tracked and recorded in the sensor and it will light up and blink the next interval that a drink is needed. The other special thing about this water bottle is that it syncs to phone or fitbit. This is great because then you can track your water intake or find a lost bottle. We cannot say enough good things about this water bottle. Were there issues? A few times it said we drank when we didn’t but it is usually on spot. We had a hard time getting the bottle to pair with bluetooth. But once it paired there were no issues. The one thing we loved was it can tell the difference between when you just put your tongue on the water bottle or take a sip of water…it is that sensitive! The price is a bit high for water bottles at 54.95…but definitely worth the price if you need to up your intake of water! To find out more about the HIRDRATE Spark 2.0 please visit their webiste using this link and get 10% off your order! When Becky Baudouin’s mother spoke those words to her, they weren’t said lightly. Her mother had an inoperable tumor–and after months of treatment, there was no hope for a longer life. There was, however, assurance of life everlasting. Learned in the dark hours of pain and the bright moments of love, the honest insights on fear, loss, and grief that Becky shares in this book are applicable to everyone’s story–including yours. If you’re losing a loved one or facing death, you won’t be alone on your journey: Becky walks with you every step of the way. There are even questions for reflection to guide you to comfort, whether you’re reading on your own or with others sharing the struggle. In times when hope seems lost, Becky’s story reveals that God is the only source for a spirit’s true healing. For anyone living with the tension of wanting to hold on yet needing to let go, Cancer, Faith, and Unexpected Joy demonstrates a powerful and profound love. When four college friends graduated from the University of Northwest Oregon, their lives stretched before them, full of promise and vows to stay connected. But life has a way of derailing well-laid plans. Now they haven’t spoken in twenty-five years. But against all odds, three of them have found themselves back in the same place–at their alma mater, wondering how they got there. When they discover their fourth friend, Hope, has died, Jenna, Ireland, and Vicky decide to embark on a wilderness adventure to honor her memory–and for secret reasons of their own. Jenna wants to show her husband that she’s more than a helpless, overweight, middle-aged empty nester. Ireland wants to get back to the nature she loves and hide from the charges being pressed against her. And Vicky wants to show she cares for something besides her ministry–and put off the disaster waiting at home for as long as possible. They never bargained for the dangers they face in an unforgiving wilderness. Now they’ll have to work together if they hope to make it home alive. While the three women fight to survive the elements, their toughest battles may be with themselves. The 3 in 1 Wallet is a wonderful little product! We liked it because it is versitle and fashionable! This is a great little wallet that can double as a wristlet and a crossbody wallet. There is a fill zip section that fans out. Plus a snap open card section on the extreior for easy access. We found that the size and functionality of this bag makes it great, not only for everyday use but for sporting events, concerts, amusement parks and other venues where you need a functional bag but one that is not cumbersome and heavy. This wallet bag is PERFECT! Laced with humor and compassion, A Pair of Miracles is the heartwarming story of her journey rearing adopted twin sons, each diagnosed with autism and fetal alcohol disorder. This is more than a moving biography from a mom on the front lines, however. It is a powerful tool, full of practical help for parents, educators, and church members working with children who have intellectual disabilities, speech impairments, and other limitations on the autism spectrum. It is also a challenge to the church to welcome and celebrate all the members of their congregation, no matter their abilities. If you are the owner of Faith and Family Reviews, or someone who enjoys this blog why not upgrade it to a Featured Listing or Permanent Listing?